Workshops: actual speeds more than carfor, historical and original activities of the group, 90 years of total experience (since 1958 OFFICINECARUSO – official service Fiat ; FORESIOFFICINE since 1983 official service Maserati ). Maturity that has allowed us to acquire a cultural background so important to push us to refine them beyond all expectations. Officine such cradles of you customers, perfectly sized spaces (2000 square meters of the Marche and Calabria ) modernly structured in compliance with the strictest quality standards imposed by the big car manufacturers, and equipped with the most advanced and sophisticated computerized diagnostic systems, with particular attention to the quality of life of our workers; technicians with over ten years experience actively involved in training programs and by best automotive brand . 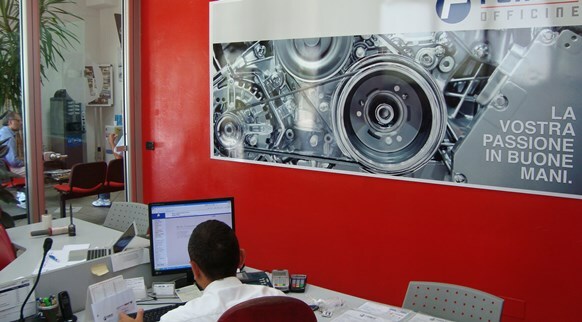 It can, therefore, provide assistance for the timely leadership and efficiency on any type of engine or car. Such preparation and specialization allows us to dedicate a service of exclusive technical assistance to the Supercar . Our technical offices, the brain of the workshops, using the latest computer technology and powerful management systems shared and integrated with other business areas, continuously organize and supervise care interventions so each operator is supported and followed the delicate process of “taking care” of your cars. The spare parts warehouses in perfect symbiosis with the technical departments have dedicated areas of over 800 square meters that allow the storage and safekeeping of spare parts at higher handling, connected on line with the most important manufacturers of car parts consent the availability of any parts in the maximum limit of 24 hours, with an operating speed of faults like no other. Replacement cars of all sizes ready and clean, a taxi service, reservations and beautiful waiting areas / relax completely reset your inconvenience.